A recent report says Samsung and LG have big plans for smartphones in 2013, at least when it comes to screen resolution. According to Korean news site MK News, both manufacturers are hoping to launch smartphones with 1080p displays within the first half of next year. Earlier this year, LG showed off a 5-inch mobile display at full 1080p resolution. The screen featured a 16:9 aspect ratio and pixel density of 440ppi, making it an improvement over the already crisp iPhone 5's 326ppi retina display. Samsung, according to the report, is developing a new smartphone screen with a pixel density of 400ppi. While a 400ppi display would still look fantastic, technically it would still be slightly under full HD resolution. If Samsung and LG do launch 1080p smartphones next year, the companies will hardly be the first. That distinction belongs to the Oppo Find 5, which will sport a 1080p display when it launches in China. However, there seems to be little chance of the Find 5 ever finding its way overseas, so your first glance of a 1080p smartphone may be to the rumored HTC DLX. While the HTC DLX is still unconfirmed, rumors suggest that the 5-inch Jelly Bean handset is coming soon, with recently leaked images showing the purported smartphone with branding for U.S. carrier Verizon. 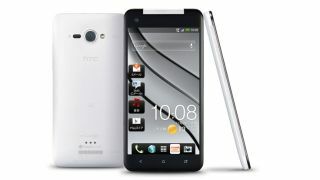 Taking a step back from rumors, HTC actually has already confirmed a 1080p smartphone with the HTC J Butterfly in Japan. Conveniently, the J Butterfly shares similar specs with the rumored HTC DLX, indicating that it could even be the same phone, just under a different name for the different geographies. Whatever HTC calls its 1080p handset, it sounds like it will only be the first of many as more manufacturers embrace full HD resolution for the next generation of smartphones.